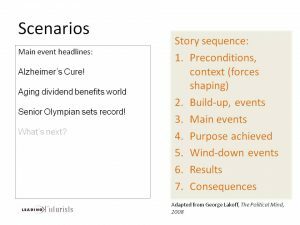 Scenarios: Practice with scenario ideas, using headlines to sketch the future. Value: helps make future challenges and opportunities clearer and more compelling to people. 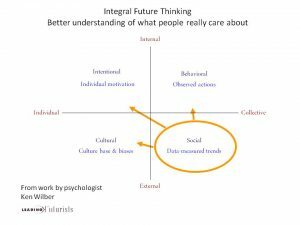 Integral Futures Analysis: Use of a “whole universe” approach to expand our ideas. Value: explores information and actions not usually covered in environmental scans. 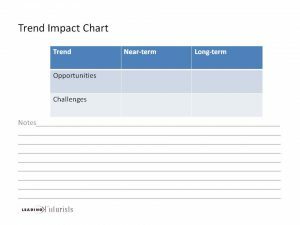 Trend Impact Analysis: a useful way to step from understanding a trend to considering its implications and its potential demands. Value: aids a group to concentrate on the specific challenges and opportunities suggested by a specific trend, or trends. 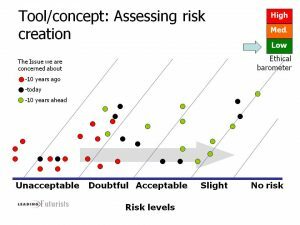 Risk creation & assessment: The tool enables people to discover their assumptions about the changing potential for risk in a project over time. Value: Risk perception changes over time but is rarely discussed in the context of the future, as it should be. 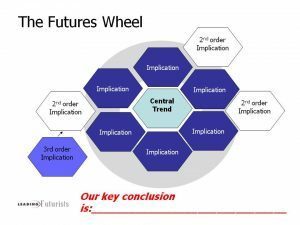 The Futures Wheel: With an important trend or issue in the center, a group brainstorms the immediate consequences. Interesting outcomes can be pursued through their second and third-order implications. Value: The wheel helps in developing the connections between emerging change and its consequences for society and/or your business/mission. Click here to see a model futures workshop agenda.